Are you searching for top home decor ideas for your family? We understand that time spent with children in the family home is precious. But, over time, the wear and tear on a home might make it look a little past due for decorating. This is only natural – after all, the years go by so fast and there is always so much to do as a parent. So, if you want to spruce up your home, there are many avenues to take. To give you some inspiration and place to start, we’ve gleaned the internet to bring you six top home decor ideas. We’ve listed several things in this article that are all great places to start when you update your decor. However, we’d like to also recommend these fabulous home décor tips to inspire your family home makeover. It is surprising the number of families that have a sofa that is worn out from years of use. Because sofas tend to be the focal point of living room design or at least make a big impact on it, pay particular attention to this detail. Then, arrange your sofa with other pieces to make a warm and cozy conversation area in your living room for all to enjoy. Wood flooring warms up a room with an earthy texture that makes everyone feel welcome. The right wood flooring is easy to care for and lasts for years of use by your family. Dress up your wood flooring with selections of carpets and rugs to enliven your decor even further. It adds softness and texture and makes a great play area for children. 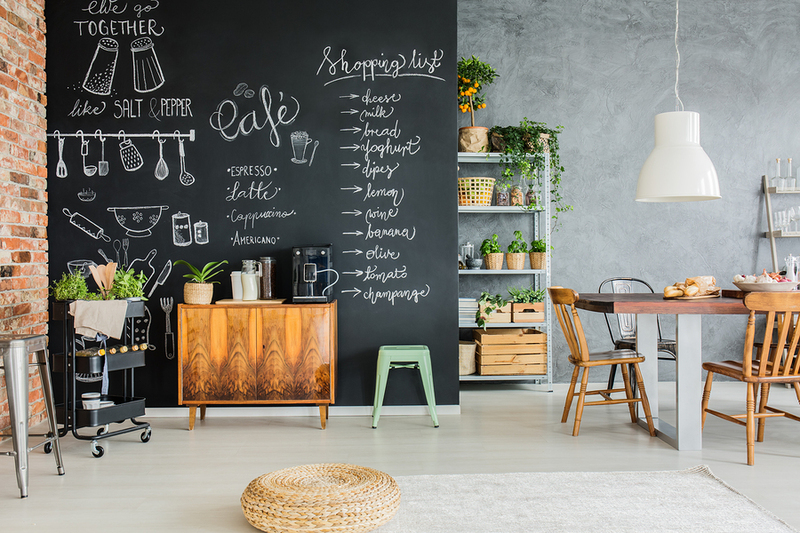 Kitchen chalkboards are not only decorative, but they are also functional. That’s a win-win for any kitchen! Use them as reminder boards, write notes to each other, or simply with a decorative drawing on the board. For a design idea that has both style and usability, this is a good choice. To find balance in your decor along with elegant design is sometimes a challenge. However, wooden shutters are an easy way to add style to any window. Also, they are a good way to offer additional insulation against summer heat and winter cold. Wooden window shutters are a great illustration of this in action – as those at shutters.co.uk show, they instantly make any home look more sophisticated when in place. Moreover, wooden shutters are also good for adding a level of privacy to your home. Easy to install and in a range of designs, they will make any home you own look amazing. When talking about family home décor we must include the children’s bedrooms. As they get older, it’s important to let them choose their own colors. This enables them to get a bedroom that feels like their very own. While you may not want to go too bright, softer oranges, yellows or blues can look really cool and give your home a new look. Family rooms are a space to reflect comfort and social interaction. Many family rooms include a wet bar and gaming equipment, for starters. It’s the perfect place to add large screens for movie watching which can be a wonderful bonding experience for your family and friends. When you decorate this room, keep in mind that this is an active room so build durability into your design. We hope these suggestions give you some ideas from which you are able to take inspiration. If you ways to improve what you have at the moment or give your property a total refresh, then, start with these tips. We wish you the loveliest decor of your dreams for you, your family, and guests.